In this groundbreaking book, Dan Buettner reveals how to transform your health using smart eating and lifestyle habits gleaned from new research on the diets, eating habits, and lifestyle practices of the communities he's identified as ""Blue Zones""--those places with the world's longest-lived, and thus healthiest, people, including locations such as Okinawa, Japan; Sardinia, Italy; Costa Rica's Nicoya Peninsula; Ikaria, Greece; and Loma Linda, California. With the audacious belief that the lifestyles of the world's Blue Zones could be adapted and replicated in towns across North America, Buettner launched the largest preventive health care project in the United States, The Blue Zones City Makeovers, which has impacted the health of millions of Americans since 2009. In The Blue Zones Solution , readers can be inspired by the specific stories of the people, foods, and routines of our healthy elders; understand the role community, family, and naturally healthy habits can play in improving our diet and health; and learn the exact foods--including the 50 superfoods of longevity and dozens of recipes adapted for Western tastes and markets--that offer delicious ways to eat your way to optimum health. Throughout the book are lifestyle recommendations, checklists, and stories to help you create your own personal Blue Zones solution. Readers will learn and apply the 80/20 rule, the plant slant diet, social aspects of eating that lead to weight loss and great health naturally, cultivating your ""tribe"" of friends and family, and your greater purpose as part of your daily routine. 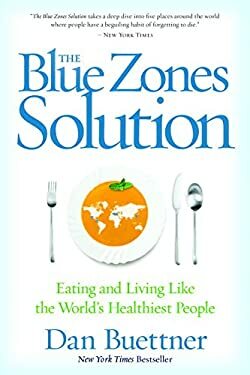 Filled with moving personal stories, delicious recipes, checklists, and useful tips that will transform any home into a miniature blue zone, The Blue Zones Solution is the ultimate blueprint for a healthy, happy life. From the Hardcover edition. New (38 available) BRAND NEW. Over 1.5 million happy customers. 100% money-back guarantee. Make your purchase count: support Better World Books' worldwide literacy partners.